John Wilfred Sawtell was born in Yeovil in 1881. He was the son of grocer Walter Wesley Sawtell (1837-1908), originally from Finsbury, North London, and his wife Mary née Gibbs, formerly Santeu (b 1851), originally from Crewkerne. Walter and Mary had five children; Walter Robert (1879-1957), James Ralph (b 1880), John Wilfred (1881-1965), Sarah Marianne (1885-1938) and Frank Horace (1886-1967). 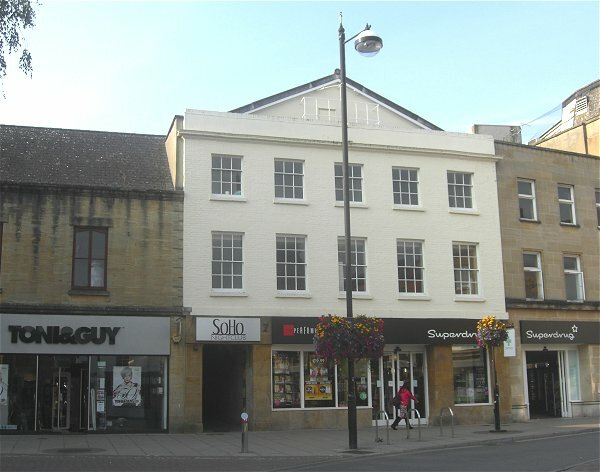 In the 1891 census Walter and Mary, together with four of their children, Walter's niece who acted as his book-keeper and a domestic servant were all listed living above Walter's grocery shop (photographed below) at 18 High Street (facing the Borough). Walter gave his occupation as 'Grocer (Master)', while the four children; James, John, Sarah and Frank were all listed as scholars. By the time of the 1901 census Walter had moved his family and were now living in Kingston, close to Fiveways. He had also given up his shop and was now working as an accountant at a glove factory. 19-year-old John was working as an ironmonger's assistant and was actually working for James Bazeley Petter at his ironmongery shop in the Borough (see Gallery). 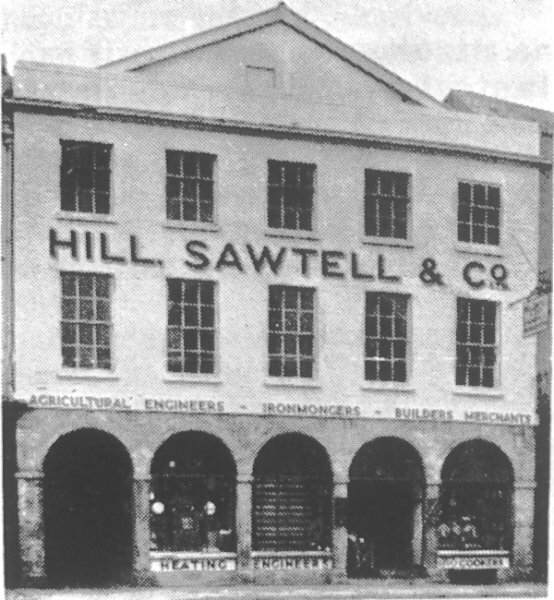 While Percy and Ernest reorganised the company their brothers Harry and Hugh, trading under the name of 'HB & H Petter', managed the original business including the Foundry & Engineering Works in Clarence Street and particularly the ironmongery and hot water heating side of the company in the Borough. But, as Percy recalled later "It was however for some reason not very prosperous, and Hugh left to commence business and carry on missionary work in Buenos Aires, and later Harry left with his family to take up farming in Australia." 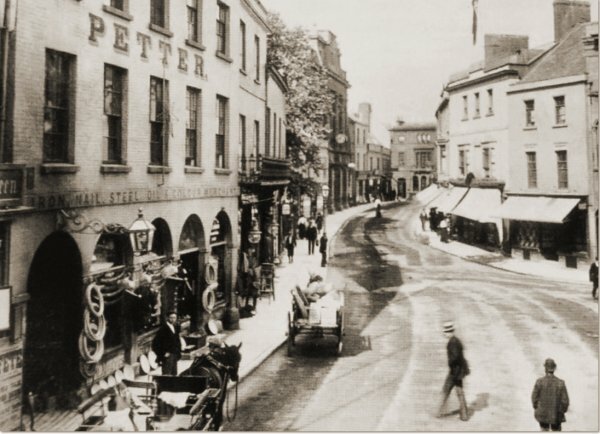 In the autumn of 1910, at Exeter, John married Exeter-born Daisy Florence Back (1887-1969), daughter of Company Accountant Stephen Back and his wife Mary. John and Daisy had one son, Wilfred Harvard. The 1911 census recorded John and Daisy living at 'Langstone', Hendford Hill. John listed his occupation as 'Ironmonger (Dealer)'. They later moved to 1 Swallowcliffe Gardens. John Sawtell died on 23 October 1965, aged 84. His will was proved in July 1965 and his estate valued at £15,007 (about £500,000 at today's value). This postcard dates to about 1903 (and was used in many forms for the following twenty years). 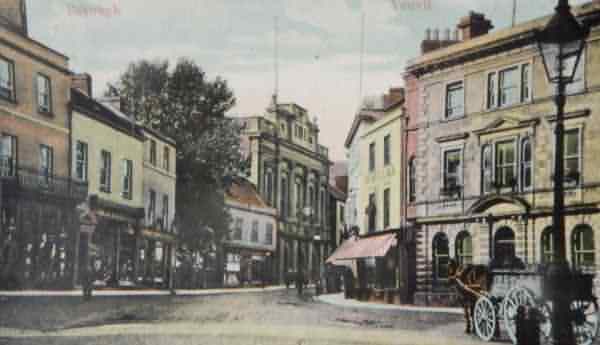 The shop to the left of the tree was the grocery shop of John's father, Walter Sawtell. To its left was the shop of Robert Damon and at far left was that of Edmund Damon.